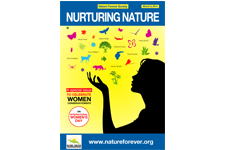 This International Women’s Day, Nature Forever Society has brought for its readers, a special issue featuring Women Conservationists in an attempt to document their journey as professional conservationists, scientists, mothers, daughters and most importantly, as women. It is with utmost pride that we are presenting to you the PDF version that any enthusiast can download and read. This issue features Ms. Divya Mudappa, Ms. Divya Shrivastava Khandal, Ms. Devica Ranade, Ms. Priyanka Runwal, Ms. Aparajita Datta, Ms. Prerna Bindra, Ms. Geetha Nayak, Dr. Gowri Mallapur and Ms. Manali Pawar for sparing their time to answer our questions and share their images for this issue. We sincerely hope and wish that everyone enjoys and relishes its content. This entry was tagged conservationists, Happy International Women's Day, magazine, Nurturing Nature, Women.